A good friend recommended this book to me, and I was excited to read it. I enjoy checking out authors who are new-to-me, and with a recommendation I could almost guarantee I’d enjoy the book—which I did. Here’s the blurb, and we can chat on the other side! 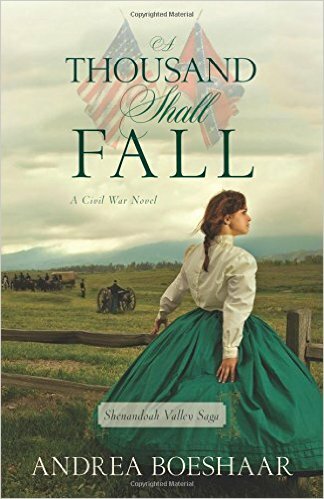 Set during the Civil War, it is obvious to the reader that Andrea Boeshaar has done her historical research before beginning this book. That facet only added depth to the setting, background, and details of her characters. Peyton Collier and Carrie Ann Bell were well-rounded and believable leads for this time period. And I loved the strength Boeshaar wove into Carrie Ann, making her immensely likeable. She was willing to do anything for her family, but she never made a decision I found unbelievable or untrue to the woman we saw on page. I enjoyed the connection she shared with Peyton who was a very strong hero in this story; soft where needed but tough at the same time. He desired to both protect those he loved and also possessed the heart of a soldier to fight and protect for the freedoms he believed everyone deserves. The story plot moved at a good pace and placed authentic conflict before all of those on the pages. The resolution of those conflicts was so natural and not drawn out, which only added to my enjoyment of the book. I even loved the secondary characters such as Aunt Ruth and Tommy. All together the pages flipped by quickly as I was immersed in a story I truly delighted in reading. 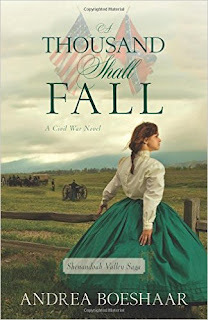 I happily give A Thousand Shall Fall 5 out of 5 stars and you can purchase it here.